I finished “Got Stripes?” to the flimsy stage last night. It took most of yesterday to get the two borders on. It always amazes me how long it takes to measure, cut, and attach borders to the perimeter of a large quilt. I usually underestimate the time I need for this task. This one is technically queen size, but I think it would fit a king size bed too as I made the outer border wider than the pattern said. I took the border fabric I had on hand and figured out how many pieces I needed, did the math, and made the border the corresponding width. The only piece of fabric left was the piece that was trimmed off in the beginning when I was squaring up the fabric–every other last bit was used! I love no leftovers! Finished size: 100.5″ x 117.5″. This is a Terry Atkinson design. 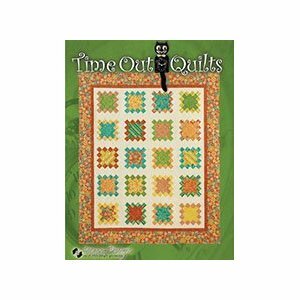 The pattern can be found in the book, “Time Out Quilts”. This one has been added to the growing, “to be quilted” pile. This entry was posted in flimsy, got stripes by Norma Hanson. Bookmark the permalink. It looks restful. The warm brown in the border and star points gives an another wise “neutral looking” quilt some pop. Well done, Norma!